Easter in Bolivia. Palm Sunday, Mundy Thursday, Good Friday, Easter Sunday. ESPAÑOL Easter is celebrated as a religious holiday in Bolivia, although in some parts chocolate bunnies and egg hunts are beginning to catch on. Throughout the Department of Santa Cruz people participate in church services, concerts, ritual blessings, and processions. The Jesuit Missions (ancient mission towns left by the Spaniards) are an especially lovely place to visit during this time. The centuries-old churches, which have been renovated, are beautiful and you can listen as local inhabitants play the baroque music taught to them by the Spanish over 500 years ago in places like San Ignacio de Moxos, San Javier and Concepción (photo). The various churches around the city and all throughout the nation schedule additional masses and services to celebrate the "Triduo Pascual" (the three most important days of Easter, Good Friday through Resurrection Sunday) and each also schedules a procession in which a statue of Jesus on the cross is paraded through the neighborhood. The smaller towns, especially the Jesuit Mission towns and others like Vallegrande and Samaipata are great places for tourists to partake in this centuries-old ritual. They are very colorful and traditional. But plan your trip well because many Bolivian nationals holiday in the Department of Santa Cruz as well, bus lines must schedule additional routes and hotels are usually full to capacity, so you have to plan your Easter vacation early in the year. Traditionally observance begins with Lent, a Christian festival that begins on Ash Wednesday, 40 days prior to Easter Sunday (although Sundays are not included in these 40 days as they are reserved for celebrating the Resurrection of Christ). Ash Wednesday is a day to cleanse the soul before the Lent fast. Christians dip their fingers in ash and mark a cross on their foreheads as a sign of penitence for their sins. During these 40 days Christians are supposed to think about the things they’ve done wrong, remember the promises they’ve made to God about living a healthy, faithful, morally righteous life. They attempt to return to this lifestyle if they’ve strayed and many, especially Catholics, do penitence for their sins. During Lent many Christians fast. This means they give up food and spend their time in prayer instead. Nowadays many give up only some foods, or other things they are addicted to such as cigarettes, alcoholic drinks, chocolate, or even addictive behaviors like gambling. All of this is done in remembrance of the 40 days and nights Jesus spent alone in the desert, praying and fasting as he prepared himself for what he already knew to be his destiny, crucifixion. In Bolivia, people may be more orthodox or strict in their observances, often giving up meat and dairy products altogether, especially on Good Friday when they eat only fish. The last week of Lent begins on Palm Sunday, on which day Christians remember the day when Jesus entered Jerusalem riding on a donkey. Palm Sunday marks the day Jesus arrived in Jerusalem to begin celebrating the Jewish holiday, Passover. On that day his followers lay palm fronds down on the road before him, a type of red carpet, if you please, and something reserved only for kings and holy men during the times of Christ. They shouted “Hosanna” which means “Savior”. This incited the wrath of the Jewish holy men who ultimately requested Herod crucify Jesus for heresy. In Santa Cruz many carry palm fronds and have them blessed by the priests at their local Catholic Church. Palm Sunday is the day Holy Week begins, which commemorates the last days of Jesus’ life before he was crucified. People weave crosses from palm fronds as well. Any crosses left over from Palm Sunday are burned. The ashes are used the following year on Ash Wednesday. In the Catholic Church Lent officially ends on Mundy Thursday the day before Good Friday, and three days prior to Easter Sunday. The word “Mundy” comes from the Latin word “mandatum”, which means “order” or “command”. During the last supper with his disciples, Jesus commanded them to love one another. He washed his disciples feet. At the time it was unheard of for a master to wash the feet of his servants, thus he symbolically showed them they were all to love each other equally regardless of their social stature. In Santa Cruz, Catholics go to the Mass of the Lord’s Last Supper. Because of this, across most of the country people work only half a day on Thursday. The next day, Good Friday, is a national holiday and no one works. Good Friday was originally called “God’s Friday” to symbolize the breaking down of the barrier of sin (as sinners are barred from entering Heaven). On this day, Christ was crucified to forgive the sins of believers by taking on their punishment for them. This gives believers the opportunity, by believing in Him, to enter the kingdom of heaven. His death paid the penalty for their sins, not his own. 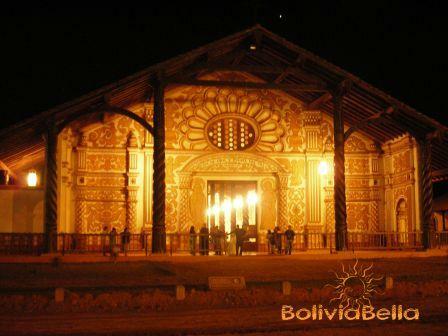 On Good Friday all throughout Bolivia all businesses and stores close, although you might find grocery stores open. Buses and taxis run their routes regularly. Many eat only fish on Good Friday for the reasons explained above. In addition, the national government applies the “ley seca” or “dry law”. Beginning at midnight Thursday and lasting through midnight Friday, no alcoholic beverages of any kind may be sold or served anywhere in the country. The next day is Holy Saturday. It is on this day that Christ’s body lay in his tomb. Many go to mass again, this time called the Vigilia (Easter Vigil). People buy wax candles etched with a cross on them at the door of the church and light the candles during mass. Sometimes people insert 5 grains of wheat into the melted wax, symbolizing the five wounds Christ suffered while on the cross (two on his hands, two on his feet, one in his side). The Vigilia is a mass observed as a symbol of “awaiting the resurrection”. Easter Sunday is observed with a joyful “Sunrise service”. A Paschal Candle is carried in through the main church door (this is a candle made with metal studs similar to the huge nails that were nailed through Jesus’ hands and feet). The Paschal candle is used to light the small hand-held candles the worshipers hold during the service. The Eucharist (Holy Communion) is served during this service. Easter is the oldest and most important Christian festival. It commemorates the resurrection of Christ after being crucified three days earlier. It symbolizes new life, the day on which the disciples of Jesus went to his tomb to mourn and found the huge stone that covered it had been rolled away and the body of Jesus was gone. He later appeared to them to tell them he had risen (he had promised them during their Last Supper that he would rise from the dead after three days). Easter falls on different dates each year, usually in late March or in April because the date is based on the lunar calendar, not our usual solar calendar. Easter was originally known as “Pascha” because it took place during the Jewish festival of Passover, which was known as “Pesach” (thus the name “Paschal” candle). Although most often people refer to it as SEMANA SANTA (Holy Week) because it is celebrated throughout the entire week, it is because of this that Easter in Spanish is PASCUA. EASTER EGGS AND THE EASTER BUNNY? Not much in Bolivia, which is why although you can buy Easter eggs and chocolate bunnies for children, the tradition of Easter gift baskets and egg hunts hasn’t quite caught on yet. According to an Anglo-Saxon legend, the Saxon goddess EOSTRE found a wounded bird and transformed it into a hare, so that it could survive the winter. The hare found it could lay eggs, so it decorated these each Spring and left them as offering to the goddess. For Christians, Easter eggs symbolize new life. To Pagans the egg's oval shape represents the eternal cycle of seasons. Egyptians and Greeks buried eggs in their tombs. A Roman proverb states, "All life comes from an egg". Eggs have been a symbol of continuing life and resurrection long before the time of Christ. This is how the tradition of giving Easter eggs as gifts began. Originally bird’s eggs were painted. This eventually gave way to chocolate and candy eggs, as well as our penchant for using the word Easter instead of Pascha (Pascua).